Lynn Symansky (USA) moved in to the lead on Under Suspection by adding just 2.40 time penalties on cross-country and finished the day with a score of 34.60pp. The horse is a 14-year-old dark bay Holsteiner mare owned by Mary Ann Ghadban. Speaking about the course, Lynn said, “Derek [di Grazia] is a fantastic course designer and he definitely made you work” and “it was big, it was technical.” The courses were all designed by Derek di Grazia of Carmel Valley, California, well-known for many of the top courses in North America including the Land Rover Kentucky Three-Day Event and Fair Hill International. Derek is the cross-country course designer for Eventing at the 2020 Summer Olympic Games in Tokyo. 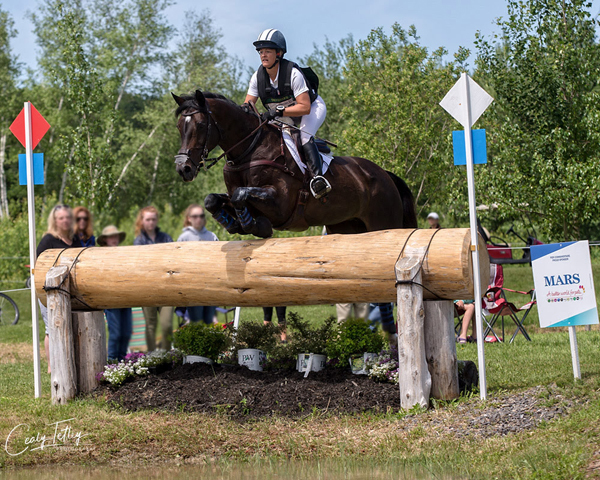 Following what could be described as disappointing rounds with other horses in the CCI3*, Boyd Martin (USA) and Contessa had a great round on cross-country in the CCI2*. Moving from equal second to first place with no penalties, Boyd and Contessa are now less than one rail ahead of Clark Montgomery (USA) and Caribbean Soul going into Sunday’s show jumping. The 9-year-old Holsteiner mare Contessa is a horse that Boyd found on a trip to a family wedding in Germany with his wife, Silva, and is owned by Club Contessa. Leading the CIC2*, a fault-free cross-country means that William Coleman (USA) and Off The Record (Timmy) stay on top going into Sunday’s competition on their dressage score of 26.10. Will and Timmy stand just 3.90 penalties head of Canada’s favourite Pan American Games gold medalist Jessica Phoenix riding Bentley’s Best. Aiken, South Carolina-based Annie Goodwin, who leads the CCI1*, describes her horse Fedarman B (Bruno) who Liz Millikin sourced in Holland as “quirky” and “very quiet” but “very hard to get on.” Annie and Bruno head into show jumping on Sunday as the leader on a penalty score of 27.10. Tied for second behind Annie are Dunham, Quebec’s Colleen Loach riding Peter Barry’s horse Vermont and another Canadian, Holly Jacks Smither, riding Candy King. The Final Horse Inspection will happen Sunday morning starting at 8:00 a.m. with the CCI1* followed by CIC2*, CCI2* and CCI3*, in numerical order. Jumping on Sunday morning is set to begin at 10 a.m. in the large ring with the CCI1* going first. For more information, visit BromontCCI.com.